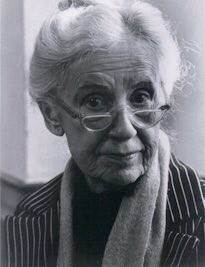 One of the early advocates of older people sharing housing was Maggie Kuhn. Guest blogger Bella DePaulo wrote about Maggie in her new book, How We Live Now: Redefining Home and Family in the 21st Century. The excerpt below appears on pp. 64-65 of the chapter on home-sharing – Chapter 3, “One Big, Happy Friendship.” You can read more about the book here. In the life story of the esteemed activist and iconoclast Maggie Kuhn, 1970 was a very big year. Forced into retirement from a job she loved simply because she had reached the age of 65, Kuhn issued her cri de Coeur: “Don’t agonize, organize.” The group she founded and led was the Gray Panthers, and old age has never been the same since. Sharing a home was Maggie Kuhn’s answer to the retirement communities that she dismissed as “glorified playpens where wrinkled babies can be safe and out of the way.” At Kuhn’s place, the couple and each of the single people had their own apartment that included a kitchen. Privacy was theirs when they wanted it, but they also shared meals frequently, sometimes celebrated holidays together, and cared for each other during illnesses. In 1980, at a White House mini-conference on older women, Kuhn told the delegates about her family of choice. She won them over. In their conference report, they included the recommendation that older women should consider sharing homes with unrelated people of all ages. Not one to wait for others to act, Kuhn founded the Shared Housing Resource Center in 1981 and ran it out of the first floor of her home. Maggie Kuhn died in 1995, but her vision of shared housing lives on. Today’s National Shared Housing Resource Center (NSHRC) is a clearinghouse of information for people looking to share their own home, to find a home to share with others, or to start their own home-sharing organization. State and regional home-sharing programs are listed in a directory. Housing professionals, researchers, government officials, and the media have all found useful resources at NSHRC. Maggie Kuhn would be proud. Author of "How We Live Now" and "Singled Out" Dr. DePaulo (Ph.D., Harvard) blogs at "Living Single" (Psychology Today), Single at Heart (PsychCentral) and on her own site "All Things Single (and More)" Visit her website at http://belladepaulo.com.